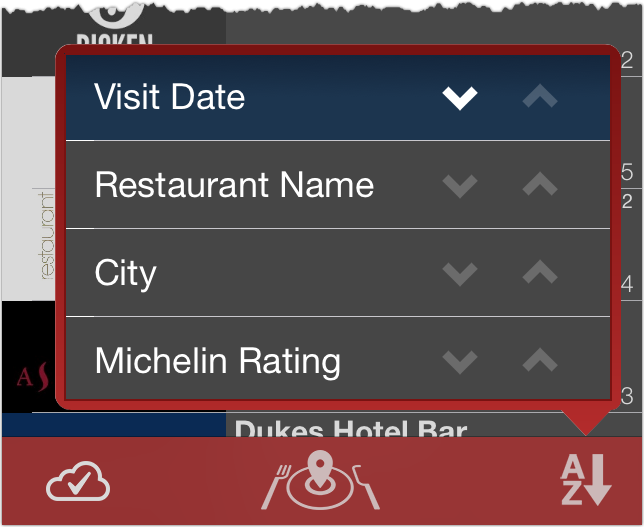 The main screen of the app shows the list of your restaurant visits. Tap an entry to go to the Visit screen, where you can view and edit restaurant details and your personal notes and rating about this specific visit. Visit Date – from recent to older, or vice versa. Michelin Rating – from 3 stars to 0 stars, or vice versa. Click the sort button to change your sorting preference (bottom right on iPhone, second from the top left on iPad).